Renowned literary great Eva Ibbotson delivers a final novel in her classic, much-loved style. 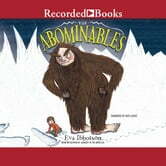 A previously unpublished work from this favorite author, The Abominables follows a family of yetis who are forced, by tourism, to leave their home in the Himalayas and make their way across Europe to a possible new home. Siblings Con and Ellen shepherd the yetis along their eventful journey, with the help of Perry, a good-natured truck driver. Through a mountain rescue in the Alps and a bullfight in Spain, the yetis at last find their way to an ancestral estate in England-only to come upon a club of voracious hunters who have set their sights on the most exotic prey of all: the Abominable Snowmen. Briskly funny and full of incident, The Abominables is vintage Ibbotson. With unforgettable characters and thoughtful messages about the environment and advocacy, it' s a generous last gift to her many devoted fans.